One of the most fascinating and attractive things about coin collecting is that you are given the option to choose. As a coin collector, you are able to choose what type of coin you wish to pursue and collect, as well as how you would like that coin to be presented. Two perfect options for presenting each individual coin is the AirTite Direct Fit coin capsule and the AirTite Ring Fit coin capsule. Both of these coin holders have numerous advantages because, as practically all coin-collecting enthusiasts know, imperfections on coins have such a direct impact, leading to direct negative impact on the coin’s value. 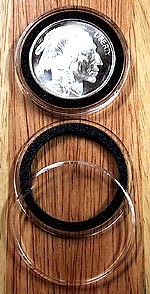 Both the AirTite Direct Fit and the AirTite Ring Fit do a remarkable job of protecting a coin from damage. The AirTite Direct Fit allows the coin to sit in more tightly, taking up less space. The AirTite Ring Fit, meanwhile, provides the coin with a cushioned foam ring — usually black or white — that allows more of a contrast between the cushioning and the coin, when clasped in the AirTite Ring Fit. Both products do an outstanding job of showcasing and presenting a coin. For specific sizing information on which coin capsule would work for your coin collection, please refer to our previous blog post with an AirTite sizing chart. Both of these coin holders are affordably priced. The AirTite Ring Fit costs just $0.89, and the AirTite Direct Fit is just $0.69 per unit. Both provide pristine/crystal viewing and storage. Silver Dollar coin holder is a name dealers, collectors and coin mints across the globe trust to provide a snug fit for the US Silver Dollar coin. The direct fit design does not utilize any rings, and is calibrated to fit coins that are 38 mm in diameter. This AirTite Direct Fit 38mm Model H – Silver Dollar holder is made from a non-yellowing acrylic material to make sure visibility remains crystal clear. These coin holders are also archival-safe, so they won’t damage your coins. 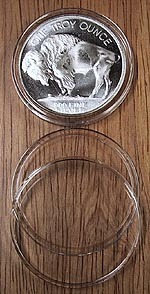 Silver Dollar coin holder utilizes a unique ring system to correspond with standard coin holders, allowing a secure storage option for less common coin sizes. Unlike the direct fits, the ring type holders are designed to accommodate a Volara Foam ring between the case and coin to secure the coin in place. The ring also adds an attractive accent to each holder and is available in 2 color options: white and black. This AirTite Ring Fit 38mm Model I – Silver Dollar holder is made from a non-yellowing acrylic material to make sure visibility remains crystal clear. These ring type coin holders are made of three snap-together components – the cover, base and ring.